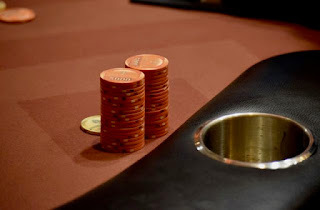 That's the final three levels of the night for Day 1B players ... 30 coming back for three 30-minute levels, then time to bag 'em up and come back Sunday at 11am for Day 2. Remember, WSOP Circuit events are NOT Best-Stack-Forward tournaments. If you bag tonight, you may NOT play another flight unless you FIRST forfeit the chips you bagged.